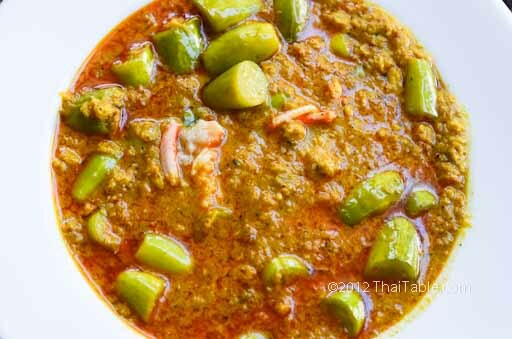 In Thailand, this curry is made with fresh crab. You'll see chunks of crab with shell and legs. It's great fun eating the crab with your hands. However, canned crab is a little more convenient to find in stores and a little less messy to eat. 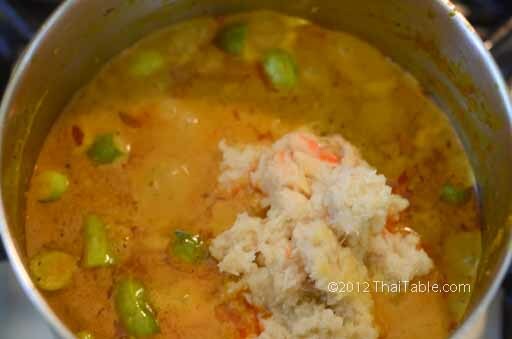 With most curries, meat goes in the pot before vegetables, but in this recipe, tindora goes in first before crab. By putting the crab in last, we minimize the chance of crab getting overcooked. This curry is quite thick, with less liquid that you normally see in other types of curry. Wash tindora then trim the ends off and cut it into thirds. Add ¾ cup of coconut milk to a pot. 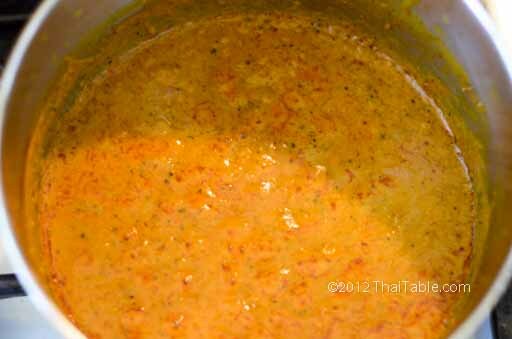 Add the curry paste and stir over low to medium low heat. 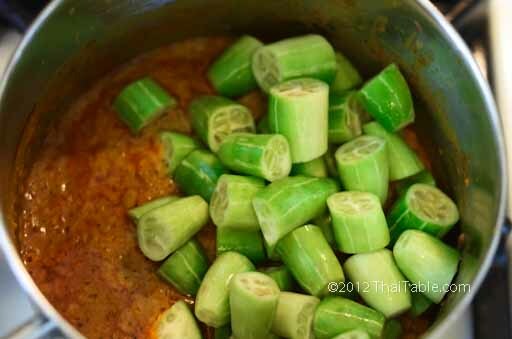 The curry paste will dissolve in coconut milk. Let it come to a simmer while stirring to prevent the bottom from burning. 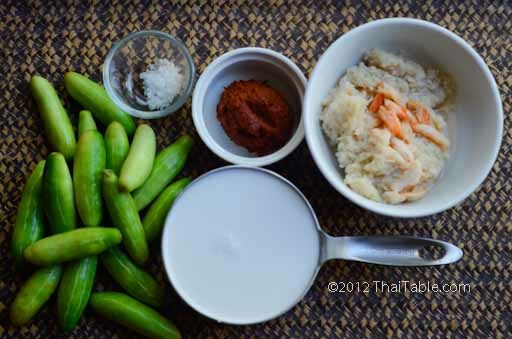 You want to reduce the liquid and let the coconut milk render the oil so that the oil will bring out the flavor and fragrance from the spices. It should take at least 5 minutes, depending on your heat, before you start to see reddish oil floating. The sauce will look like curdles. The red oil starts to pool. Add the tindora. Stir to mix the tindora with the curry sauce. Add the rest of coconut milk. If you are using canned or UHT coconut milk, add ½ cup of water and swirl/shake to get the last bits of coconut milk in the container out. Pour that diluted coconut milk into the pot. Let it come to a boil and cook for 10 minutes. Taste to see if you need to add salt. Some commercial curry paste can be more salty than others. If you're using canned crab, taste your crab if it is salty as well. You may not need any salt after all. I use my homemade curry paste, so I added 1 teaspoon of salt to the curry. 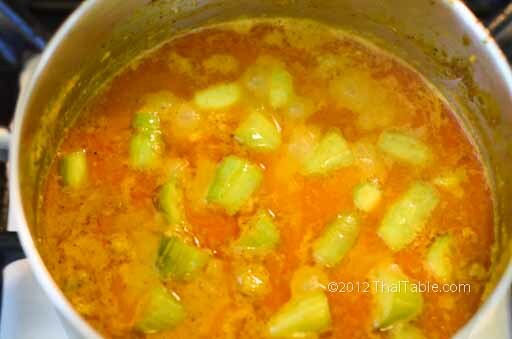 Add the crabmeat and stir. Let it boil again. Taste to see if you need any more salt. Add salt to taste. 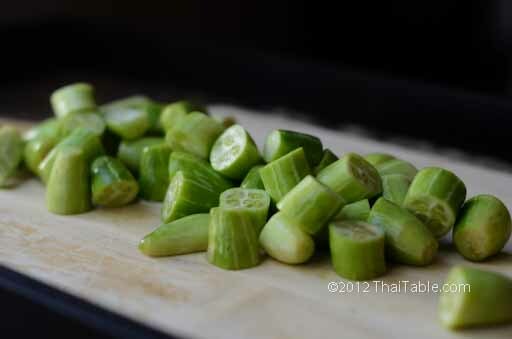 If you like your vegetable crunchy, at this point the tindora has a nice crunchiness to it.